Borders Line: Hilary Mantel’s WOLF HALL Sequel Will Rock | Birth.Movies.Death. WOLF HALL is one of the best novels of the past few years, and its sequel is right around the corner. Bring Up the Bodies, Hilary Mantel’s Wolf Hall sequel, will be released on May 22. The novel is the second in a proposed trilogy telling the story of Henry VIII from the eyes of his oft-overlooked minister Thomas Cromwell. Very little is known about the life of Thomas Cromwell before his ascendency to power under Henry’s reign; Wolsey and More are the far more prevalent Thomases of the Tudor era. Cromwell made a name for himself by assisting Cardinal Wolsey in dismantling monasteries to raise money for the state and then neatly avoiding association when Wolsey quickly fell from Henry’s ever-fickle grace. Cromwell soon found himself responsible for the supervision of all of Henry’s chief affairs and became one of the most powerful men in the country. Cromwell best endeared himself to Henry by virtue of his tireless efforts to find legal and religious justification for his annulment to Queen Catherine of Aragon so he could marry Anne Boleyn. After five years of legal wrangling, Cromwell managed the trick, influencing Commons to declare the marriage unlawful due to the fact that Catherine was once married to Henry’s older brother. Henry threw over Catherine, married Anne Boleyn and made Cromwell his chief minister and principal secretary, as well as offering him offices of power in the court and the Exchequer. Cromwell then made moves to strike at the Papacy under Henry’s instruction, formally freeing England from Rome’s influence. But Cromwell’s time in the sun was by necessity brief, as is true of anyone Henry favored. After the execution of Anne Boleyn and the death by natural causes of Henry’s third wife Jane Seymour, Cromwell urged Henry to marry the homely German princess Anne of Cleves. Henry resented Cromwell for this and eventually had Cromwell executed. I’ve always found the story of Thomas Cromwell fascinating. (Full disclosure: I find all Tudor history fascinating. I’ve read a ridiculous amount on the matter.) Here is a man who gave everything to Henry VIII; he betrayed and made enemies of every other person in the nation. He threw over a loving, innocent wife and the entire Catholic Church to garner Henry’s favor, and he made one mistake – urging the King to marry an unattractive woman in order to solidify ties with Germany. Once the king made his displeasure known, Cromwell again moved heaven and earth to annul the marriage, but it was too late. He lost everything – including his life. Mantel’s Wolf Hall gives a fictional, but riveting, account of the early part of Cromwell’s life, filling in rich details where none are known, and following him through his initial rise to power. The novel ends after Henry has won his beloved Anne Boleyn, and Bring Up the Bodies will open with Henry’s disenchantment with his wife. Wolf Hall is by far my favorite book of the past few years. Mantel paints a deeply human portrait of the enigmatic Cromwell, and offers what might once have seemed impossible: a fresh perspective on the hoary old tale of Henry VIII and his six wives. The novel is authentic, moving and profoundly engrossing. I’m telling you now so you have plenty of time to read the first lengthy novel before nabbing the sequel in May. 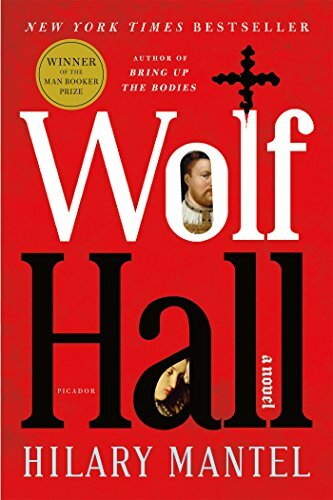 Even if one isn’t particularly inclined toward royal historical fiction, just know that Wolf Hall is a brilliant novel in its own right, far outside that very specific genre. Mantel is an incredible writer, and I’m anticipating Bring Up the Bodies more than any other book this year. Stay tuned for a review.